On April 27, 2018, the President Kim Jong-un became the first North Korean leader to set foot on the South Korean territory since the end of the Korean War in 1953 after he crossed the heavily fortified demarcation line at 9:30 a.m (local time) and shook hand with South Korean President Moon Jae-in. In the rarest move, state-run TV and the official KCNA news agency hailed the talks and the leaders' commitment to seek "complete denuclearisation". The summit came just months after warlike rhetoric from the North. However, the statement did not provide any new specific measures North Korea would take toward denuclearization. "As I stand here today I can see that South and North Korea are the same people, the same blood -- they cannot be separated," Kim said in his address during the summit. In response to the statement, Trump tweeted, "KOREAN WAR TO END! The United States and all of its GREAT people should be very proud of what is now taking place in Korea!" In a separate tweet sent minutes earlier, Trump said that "good things are happening, but only time will tell." The meeting was held at the heavily fortified Demilitarized Zone that has divided the Koreas for more than six decades. Kim and Moon announced they would work with the United States and China this year to declare an official end to the 1950s Korean War, and establish a permanent peace agreement. The conflict was stopped after an armistice was reached in 1953, but the two Korean states are still technically at war. 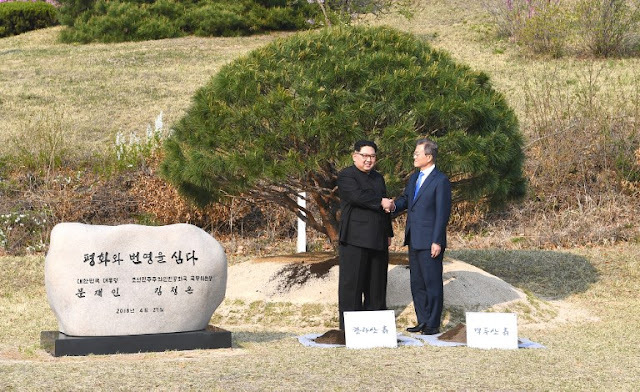 Moon has also agreed to visit Pyongyang sometime later this year, and also agreed to open a permanent communication office in the North Korean town of Kaesong and the resumption of temporary reunions between relatives separated by the war. Tensions in the region escalated last year after North Korea test-launched several ballistic missiles and performed a nuclear test, while Kim and Trump traded threats and insults. However, since February 2018, multiple high-level talks between Seoul and Pyongyang have occurred, leading to an unlikely invitation from the North Korean leader to Trump for a face-to-face meeting and, indirectly, Kim's first foreign visit to neighbor and ally China. Later in March 2018, Kim signaled that he would not oppose joint US-South Korean military exercises, which had been postponed while South Korea hosted the Winter Olympics. And days before this historic summit, on April 20, 2018, Pyongyang dropped its long-held demand that the United States withdraw forces from South Korea in exchange for denuclearization. Currently, the United States has about 28,000 troops stationed in South Korea, a presence that has long irked North Korean leader Kim Jong Un. For the U.S., North Korea's will to relinquish nuclear weapons depends on certain conditions if they are fulfilled, experts warn. Those prerequisites include terminating America's regional nuclear umbrella, a security arrangement in which Washington promises in-kind retaliation on behalf of close allies if they are attacked with nuclear weapons. That's why many geopolitical analysts remain skeptical about the North's apparent enthusiasm for engagement.